It’s already been nearly 50 degrees, and the ice pack on the rail trail and mountain bike trail is almost non-existent. If this weather keeps up, the trails will be rideable much sooner than years past. Baxter also tells us Puxatony Phil was wrong! 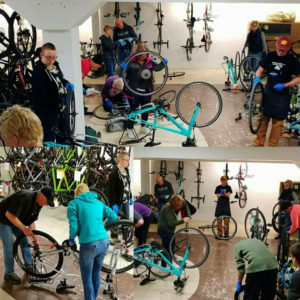 Get those bikes ready, so you don’t miss good weather when it breaks! Join us for another glow bike slow roll through the streets of Alma. Friday February 16th at 5:45 we will ride to the Alma Biggby for a coffee or hot chocolate. We’ll stash our bikes in the shop and then head to Alma Brewery for drinks and food. 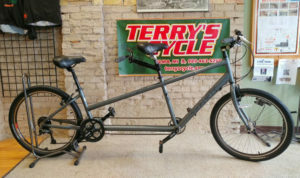 For such a romantic occasion, our tandem rental is free (1st come 1st served). 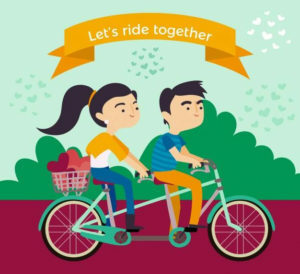 Grab your favorite person and let’s ride! *Headlights and tail lights are required and a city ordinance. Helmets are strongly recommended. *Arrive early to decorate your bike with lights. Now through the end of March, purchase a Basic Tune-up and get a free Bontrager cycling cap and T9 chain lube. $45 – Includes adjustment of all components, wheel truing, and chain lubrication. 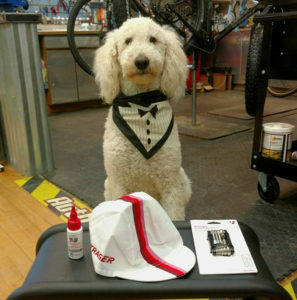 Step up to our Plus Tune-up and get the lube, cap, a Sugoi musette bag, and a Bontrager muliti-tool. $75 – Includes the Basic service plus the removal and de-greaseing of the drive train. Beat the rush! Get FREE stuff! Drop your tune-up off now!! Due to continued demand and a limited number of participants per class, we are going to host another tube change class. 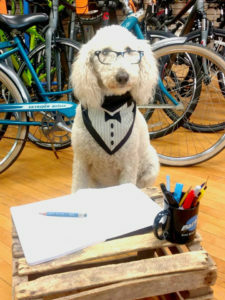 The class will take place at Terry’s Cycle on February 10th at 3:30pm. You will need to bring your bike and a set of tire levers. The cost is $20 (plus $3.19 for tire levers if you need them). We will provide a floor pump, but you can bring your own pump if you need practice using it. Please, call the shop to sign up for the class: 989-463-5260. The class is open to the first 10 people. Call the shop to reserve your spot! Tools and tube change supplies will be marked down 20% during the event. 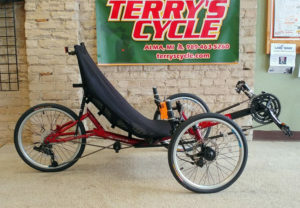 We are now stocking Sun Seeker recumbent bikes. 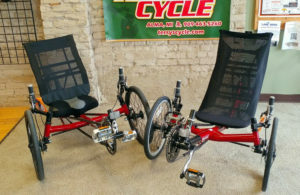 We have two models of recumbent tricycles and one traditional recumbent in stock. Stop in for a test ride. You’ll be amazed!! 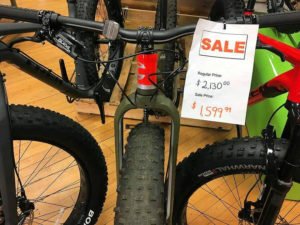 We have some fat bikes on sale. Winter isn’t totally over, and these babies make great year-round bikes. They literally will go anywhere – the beach, sand dunes, two tracks, mountain bike, trails, and gravel roads. With tires this capable, the sky is the limit! 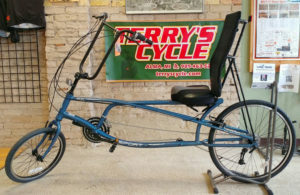 We have now a tandem to rent. It is a one-size fits most bike. 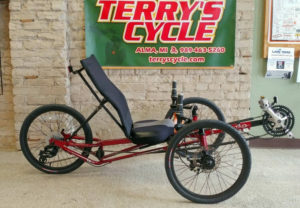 It’s great for the rail trail or cruising around town. This thing will take any relationship or friendship to the next level – good or bad!! In all seriousness, these are a fun way to see the town and get some exercise. Tandem rentals are ten dollars an hour. Honing your communication skills – priceless. 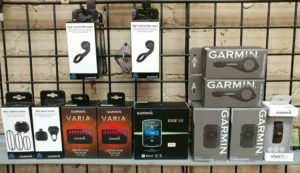 We have lots of new Garmin inventory. 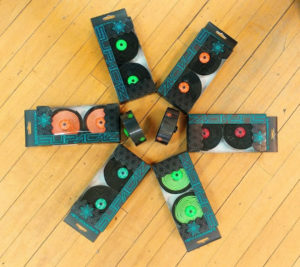 New Varia Radars have arrived. The new Garmin Charge external power pack is here and will breathe extra life into any of your old Edge GPSs or give your Edge 1030 40 hours of battery. The Vivofit 3 fitness tracker is guaranteed to stomp all over those Fitbits. The item we are most excited about is not actually here yet. Very soon, the Forerunner 645 Music GPS watches will be here. These elegantly crafted watches will hold up to 500 songs. No more carrying a music player with you, or exposing your phone to undo abuse and harm. Just push play on your wrist and go! Garmin; what will they think of next? This is literally the most durable bar tape we have ever used. It comes in some snazzy colors too. Chances are if you have bar tape on your bike, it needs to be refreshed (save yourself a shock and skip looking at what has built up under your tape). Stop in for some SUPACAZ – wonderfully colorful and super strong. This is a new product line for us. So far, we are more than pleased with their products. They offer some great electronic accessories like wired and wireless ear buds, speakers, power packs, and charging cords. 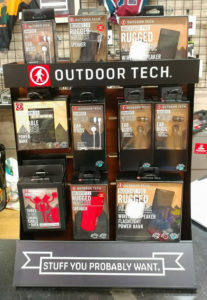 Most customers find they use their Outdoor Tech products as much off the bike as on.